Such a troubled world we live in. And it’s not getting any better. Poverty, disease, oppression, ethnic conflict, and wars have been the scourge of mankind from the beginning of time; but since the First World War they have increased exponentially on a global scale. Before the First World War which was labeled the War to End All Wars—because no one could imagine that it would ever be repeated—combat casualties were seldom counted in more than tens of thousands. But the predictable progression of technology coupled with the relentless regression of morality resulted in the horrifying military and civilian deaths in World War I and World War II that were measured in the tens of millions. With millions more wounded and displaced from their homes, right up to the estimated 10 million refugees from today’s slaughter in Syria. As if the incredible increase in the sophistication and destructive power of conventional armaments and munitions in just twenty years’ time from World War I to World War II (tanks, ships, planes, submarines, small arms) wasn’t enough; by the end of the second world war, we found a way to harness and unleash the fearsome fission and fusion power of the atom itself. Indeed, the atomic bomb brought a swift end to the Pacific War against Japan; and as accurately calculated by both military and civilian experts, actually saved hundreds of thousands of Allied and Japanese lives that would have been lost through additional weeks or months of conventional warfare. Subsequently, nuclear arsenals of some of the world’s major powers have ironically served as a deterrent to flash point incidents that could trigger a third world war, such as the Cuban Missile Crisis between the United States and Russia in 1962. But now this nuclear cloud hangs ominously over every man, woman, and child on the planet. How long can the apocalyptic potential of a nuclear war be restrained? Especially, if a rogue nation like North Korea decides a first strike is worth the risk. Or an equally rogue nation like Iran develops and uses nuclear warheads to accomplish its sworn agenda of eliminating Israel from the face of the earth? Like never before in the history of the human race, the world we live in is on the precipice of an unparalleled cataclysmic catastrophe that could shatter mankind beyond recovery. With regard to such magnitude of destruction, according to the Bible there is both bad news and good news. The warning of this world-wide disaster comes from Jesus Christ, himself, speaking of the Great Tribulation: “For there will be greater anguish than at any time since the world began. And it will never be so great again. 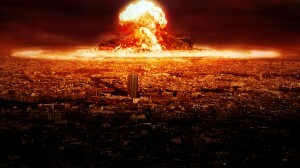 In fact, unless that time of calamity is shortened, not a single person will survive…” (Matthew 24:21-22). Jesus assures us that the human race will survive. He can make that kind of guaranteed promise because he, himself, will intervene. He can and will do that because he is, in fact, God’s Messiah and God’s Son, as affirmed in last week’s article based on three (of several) astounding passages in the Old Testament … Psalm 2 and Psalm 110. And, Genesis 1, which announces the plurality of God (Trinity) when it says: “Let us make human beings in our image to be like ourselves” (Genesis 1:26). First, a couple of excerpts (in italics) from last week’s article regarding the Lord God declaring that the Messiah (King) is, indeed, God’s Son. Then the passage states, “For the Lord declares: ‘I have placed my chosen king on the throne in Jerusalem, on my holy mountain’” (Psalm 2:6). The chosen king is the Messiah and the context pertains to the end-times reign of God’s Messiah. “I will surely tell of the decree of the Lord. He (the Lord) said to Me, ‘You are My Son, Today I have begotten You. Ask of Me, and I will surely give the nations as Your inheritance, and the very ends of the earth as Your possession’” (Psalms 2:7-8, NASB). The first Me is the King; the second Me is the Lord (God) … the King’s Father. “The Lord says to my Lord: ‘Sit at My right hand until I make Your enemies a footstool for Your feet” (Psalm 110:1, NASB). Who is my Lord? To whom is David referring … who is David’s Lord? Frequently King David speaks of the Lord, his God. Meaning the one true and living God of Israel. But here David proclaims that the Lord God is talking to another Lord, who is (also) David’s Lord. We know this second Lord is the Messiah because of what the rest of the chapter tells us concerning Messiah’s rule and role as the Scepter of Zion and the judge among the nations. But the crucial component of this magnificent passage is that the Messiah is (also) David’s Lord (my Lord) who is inherently equal to The Lord (God); but with a different role or position or expression of that deity. The Triune Personage of Almighty God is not three separate gods. He is One God in Three Persons. This plurality is plainly present in God’s first introduction of himself in Genesis. Nearly all Jews who know anything at all about their heritage and chosen place in God’s created universe agree that Messiah comes from King David’s lineage of the tribe of Judah. Through the inspiration of the Holy Spirit, it was none other than King David, himself, who spoke of Messiah—God’s Royal Son—as David’s Lord! In the very first book of the New Testament, the Jewish Apostle Matthew provides a meticulous, but amazing genealogy of Jesus of Nazareth … descending from King David. From there, the remainder of the New Testament (Covenant) gives us convincing historical records that Jesus, himself, claimed to be this Messiah—Son of God, Son of David, Son of Man. Fully God and fully man. Furthermore, he validated these claims with many marvelous miracles, teachings that astounded even the most educated and religious Jewish leaders, and most of all his spectacular resurrection from the dead. The Jewish Apostle Paul, who had a personal salvation encounter with Messiah Jesus while Paul was on his way to Damascus to arrest, imprison, and possibly execute Christians, later wrote to Titus: “…while we look forward with hope to that wonderful day when the glory of our great God and Savior, Jesus Christ, will be revealed” (Titus 2:13). It was plainly evident to Paul that Jesus Christ was not only the Son of God, but also God the Son. And that Messiah Jesus would return as King to fulfill the hopes of believers, Jew and Gentile alike, for peace and justice in an otherwise hopeless and unjust world. Moreover, Jesus frequently referred to God as his Father. The purpose of these statements was to further affirm and clarify that God is One God in Three Persons, and that Jesus was God the Father’s Son, thus, the appointed Messiah. But also to emphasize the fact that God the Father was exclusively Spirit. Said Jesus to the woman at the well: “For God is Spirit, so those who worship him must worship in spirit and in truth” (John 4:24). It was Jesus who became God Incarnate … God in human form. Because it was necessary that Jesus’ blood be shed as a man; a propitiation for every person who would believe … satisfying God’s requirements through the Law that innocent blood must be spilled as a redemptive atonement for mankind. With the exception of thousands of Jews who believed and received Yeshua as their Lord and Savior in the first three hundred years or so after the birth of Christ and hundreds of thousands of Messianic Jews in today’s world, most Jews tend to think only of Jesus as a post-Old Testament person who started a new religion, as recorded in the New Testament. Consequently, they are under the impression that when a Jew leaves Judaism and becomes a Christian, that he or she undergoes a conversion (converts) to Christianity. That simply isn’t what happens. Nor is it true of a person converting from say, Islam to Christianity. Biblical salvation through believing and receiving Jesus as Messiah Lord and Savior is not a conversion from one religion to another. As said several times in prior Eye of Prophecy articles: Biblical Christianity is not a religion—unless Roman Catholicism and the cults are considered. Instead, Biblical (God’s) salvation is a personal relationship with God available through personal trust in the once for all sacrificial atonement of Jesus’s death on the Cross. It is simply believing and accepting what God through Messiah Jesus has done for us; that which we could not do for ourselves through all the requirements of religion or man-made privileges of race, e.g. membership, maintaining religious rituals, good works, or innate worth by virtue of being born into a particular race or religion. Jesus of Nazareth proved beyond any reasonable doubt that he was Divine (God the Son) through his supernatural signs and wonders, with his own resurrection from the dead the most amazing miracle of all. That is an authentic historical fact, affirmed by hundreds who saw him after he arose from the dead. Moses wrote about the plurality of God, which later became known as the Trinity. King David attested to the truth that the Lord God called another (Person) Lord and that this Lord was God’s Son. Micah prophesied that Messiah would be born in Bethlehem, but that his origin was from the distant past … from eternity. The prophet Isaiah said that He (Messiah) “…was pierced for our rebellion, crushed for our sins … All of us, like sheep, have strayed away. We have left God’s paths to follow our own. Yet the Lord laid on him the sins of us all” (Isaiah 53:5-6). Once again, the personal pronouns used by Isaiah are just that … personal. They cannot possibly refer to Israel, if for no other reason that Israel cannot and does not qualify to atone for its own sins. Let’s look at another magnificent prophecy from Isaiah that Messiah is God, who would come to the earth in human form. In this sweeping timeless (to God) announcement, we find both the first advent of Jesus Christ (as the suffering servant of Isaiah 53) and his second advent (return to earth to establish the Kingdom of God). Well into the Great Tribulation we read what will happen: “Then I heard a loud voice shouting across the heavens: ‘It has come at last—salvation and power and the Kingdom of our God, and the authority of his Christ…” (Revelation 12:10). In addition to Old Testament descriptions of the coming Messiah, some of which have been examined in last week’s and this week’s article, there are also several spectacular sightings of Messiah in the Old Testament—what a handful of scholars (including me) refer to as the Pre-Incarnate Epiphanies of Jesus Christ. I firmly believe that the purpose of these amazing personal appearances of God in the flesh was to proactively and prophetically reinforce the written predictions about the Messiah … as David’s (other) Lord and God’s Royal Son. As well as to correlate with and be a prototype of the actual (final) birth of Messiah, i.e. born of a Virgin conceived by the Holy Spirit. Fully man and fully God. The Old Testament pre-Incarnate appearances gave God’s own people, the Jews, a wonderful preview of the greatest coming attraction of all time: God’s Son in human form. To prepare Israel and the nations for the greatest event of human history: That God the Son was born in Bethlehem, lived among his people, was crucified, buried, and rose the third day; and is now seated at the right hand of God until the appointed day of his magnificent return to the earth in that same resurrected and glorified body in which he will rule and reign forever from Jerusalem. Time and space will permit identification of only three of these Pre-Incarnate appearances. However, before we examine each one, it is vitally important that we understand this basic premise (fact) that will be supported by these examples: God the Father is Spirit and ONLY Spirit. Thus, each of the Epiphanies depict God’s Son, Jesus Christ; as only he is the express image of God in human form. (Colossians 1). Another important thing to remember is that God’s angels often take on human form throughout both the Old and New Testament. However, two significant factors enable us to determine whether these men are angels or the Messiah, himself. (1) The context and events of what is taking place including Scripture stating that The Lord is speaking (2) Whether or not the actual people involved in the encounter refer to the angel as Lord, or as just an angel (messenger). Many know the story of Sodom and Gomorrah in the Bible entailing Abraham’s passionate intercessory plea that God withhold his judgment for the sake of just ten righteous people. This event begins with: “The Lord appeared again to Abraham near the oak grove belonging to Mamre. One day Abraham was sitting at the entrance to his tent… He looked up and noticed three men standing nearby…” (Genesis 18:1-2). As the passage tells us, this was not the first time that the Lord appeared to Abraham. Nor was it the first time that God took on the form of a man. That occurred when Abraham met the mysterious King of Salem. Several scholars including me believe that this man, Melchizedek, was none other than the Pre-Incarnate Messiah (Jesus). In the book of Hebrews we read the account of Melchizedek first recorded in Genesis. “This Melchizedek was king of the city of Salem and also a priest of God Most High. When Abraham was returning home after winning a great battle against the kings, Melchizedek met him and blessed him … The name Melchizedek means ‘king of justice,’ and king of Salem means, ‘king of peace.’ There is no record of his father or mother or any of his ancestors—no beginning or end to his life. He remains a priest forever, resembling the Son of God” (Hebrews 7:1-3). In Hebrews Chapter 5 and later again in Chapter 7, the author quotes Psalm 110, which we examined in last week’s article as a pivotal passage in which King David makes this astounding statement: “The Lord said to my Lord, ‘Sit in the place of honor at my right hand until I humble your enemies…” (Psalm 110:1). “The Lord has taken an oath and will not break his vow; ‘You are a priest forever in the order of Melchizedek’” (Psalm 110:4). There’s absolutely no ambiguity or confusion as to what David is saying, especially when you combine Psalm 110 with Psalm 2, and other passages such as Micah 5. The author of Hebrews summarizes by saying: “There were many priests under the old system, for death prevented them from remaining in office. But because Jesus lives forever, his priesthood lasts forever. Therefore he is able, once and forever, to save those who come to God through him. He lives forever to intercede with God on their behalf. He is the kind of high priest we need because he is holy and blameless, unstained by sin. He has been set apart from sinners and has been given the highest place of honor in heaven” (Hebrews 7:23-26). Returning to the story of the three men who visited Abraham, the context is crystal clear: Abraham knew that two of the men were angels, but the third was the Lord, himself. Why can we say that with utmost certainty? Because in the written account by Moses, he refers to this man as, The Lord. 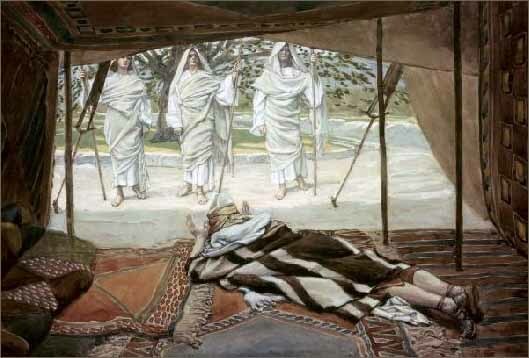 Moreover, Abraham addresses him as Lord. He also said: “…Should not the Judge of all the earth do what is right?” (Genesis 18:25). Then later Abraham says, “…Since I have dared to speak to the Lord, let me continue—suppose there are only twenty?” (Verse 31). Therefore, in light of the Biblical evidence that God is Spirit, the intriguing question before us is whether God (the Father) appeared to Abraham as Melchizedek and later as one of the three men at Abraham’s tent as The Lord (who said to my Lord); or if he was David’s (my) Lord to whom The Lord was speaking (Psalm 110). Especially to Jews and Judaism, would the God of Abraham, Isaac, and Jacob, himself, actually appear in bodily form? Likewise: Is it possible for a human being to look at/on the Most High God (El Elyon, in Hebrew) and live? According to what God told Moses and the Israelites, to gaze on God’s glory (God, himself), meant certain death. Which is why the Lord shielded the brilliant, but lethal light of his Holiness from the Israelites in a dense cloud or pillar of fire. Let’s look at another stunning person to person encounter with the Lord God, as experienced by Abraham’s grandson, Jacob. “Meanwhile, Jacob left Beersheba and traveled toward Haran. At sundown he arrived at a good place to set up camp and stopped there for the night … As he slept, he dreamed of a stairway that reached from the earth up to heaven. And he saw the angels of God going up and down the stairway. At the top of the stairway stood the Lord, and he said, ‘I am the Lord, the God of your grandfather Abraham, and the God of your father, Isaac. The ground you are lying on belongs to you. I am giving it to you and your descendants” (Genesis 28:10-13). “During the night Jacob got up and took his two wives, his two servant wives, and his eleven sons and crossed the Jabbok River with them. After taking them to the other side, he sent over all his possessions. This left Jacob all alone in the camp, and a man came and wrestled with him until the dawn began to break. When the man saw that he would not win the match, he touched Jacob’s hip and wrenched it out of its socket. Then the man said, ‘Let me go, for the dawn is breaking!’ But Jacob said, ‘I will not let you go unless you bless me.’ ‘What is your name?’ the man asked. He replied, ‘Jacob.’ ‘Your name will no longer be Jacob,’ the man told him. ‘From now on you will be called Israel, because you have fought with God and with men and have won.’ ‘Please tell me your name,’ Jacob said. ‘Why do you want to know my name?’ the man replied. Then he blessed Jacob there. Jacob named the place Peniel (which means ‘face of God’) for he said, “I have seen God face to face, yet my life has been spared’” (Genesis 32:22-30). So much could be said concerning this astonishing event, such as why God would even engage Jacob in a physical wrestling match, and let Jacob win. However, in summary, there is no doubt, whatsoever, that the man was the Lord, himself … not an angel. With Jacob breathing a sigh of immense relief that he had physically touched the Lord, and had seen God face to face and lived to tell about it. But how could this be? How could this be the God whom not even Moses could look on face to face and live? Scripture tells us that God spoke to Moses face to face, but that clearly is a figurative way of saying it was (what we would call) a person-to-person or one-to-one communication. We know this to be true because every time that Moses entered the Tabernacle or met The Lord on Mt. Sinai, God enshrouded himself in a dense cloud to protect Moses from God’s lethal glory. The text is quite evident that this was not a dream Jacob was having; it was remarkably real. 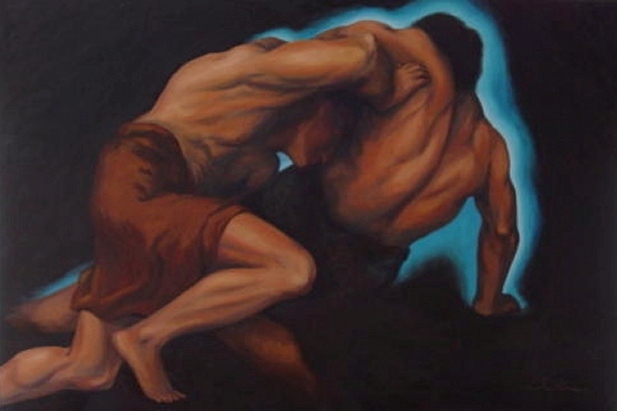 Consequently, it could not have been God (the Father) who literally wrestled with Jacob. Thus, if we accept the unmistakable evidence of Scripture that God appeared in human form (as God’s Son, the Second Person of the Trinity) throughout the Old Testament, then why is it so difficult to believe that Jesus of Nazareth is God’s final incarnate appearance (once and for all)? Did you know or remember that God actually appeared in human form on Mount Sinai? I think many students of the Bible often overlook that amazing account. This was over four hundred years after Joseph, then Jacob and his family, took up permanent residence in Egypt. By and large, the Israelites had forgotten about their Lord—the God of Abraham, Isaac, and Jacob. It was time to be reintroduced to the God of Israel, who would continue with his plan to bring salvation to the world through the Jews, inevitably and specifically through the Jewish Messiah, Jesus. Did you know that the Ten Commandments (along with other features of the Mosaic Law) had been given directly by God to Israel even before Moses ascended Mt. Sinai and received the stone tablets upon which the “finger of God” wrote the Ten Commandments? You can read about that in Exodus Chapter 20. In fact, when God delivered the Commandments to the people, his thunderous voice so frightened them that they pleaded with Moses: “…You speak to us, and we will listen. But don’t let God speak directly to us, or we will die!” (Exodus 20:19). Prior to that God had given explicit instructions to Moses that the people were not to ascend Mt Sinai or even touch the mountain—upon the pain of death. 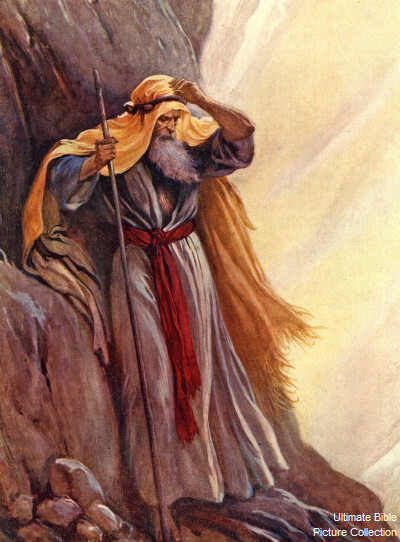 But then the Lord made a temporary exception that Aaron, Nadab, Abihu, and seventy of Israel’s elders could accompany Moses in a climb up the mountain; for the express purpose of meeting with God to worship him and to celebrate the Covenant that all the people had agreed to, “…do everything the Lord has commanded” (Exodus 24:3). “Then Moses, Aaron, Nadab, Abihu, and the seventy elders of Israel climbed up the mountain again. There they saw the God of Israel. Under his feet there seemed to be a surface of brilliant blue lapis lazuli, as clear as the sky itself. And though these nobles of Israel gazed upon God, he did not destroy them. In fact, they ate a covenant meal, eating and drinking in his presence!” (Exodus 24:9-11). Later, God again veiled his presence in a dense cloud of fire and smoke on the mountain. God called (and spoke) to Moses from within that cloud. Although Moses doesn’t provide a detailed description of “The God of Israel” in this scene, it is fully obvious that who/what they saw was a man, in human form. Why can I say that? Because the passage says, “under his feet…” with the clear connotation that they were the feet of a man. In fact, with the exception of animal’s feet, what other kind of feet could they be? Yet we also know that Moses, himself, was not allowed to look on (the face of) God directly. That fact is inescapably evident from the equally well-known story of what happened when Moses subsequently pleaded with God to, “…show me your glorious presence” (Exodus 33:18). Do you remember the Lord’s reply? He said: “I will make all my goodness pass before you, and I will call out my name, Yahweh, before you … But you may not look directly at my face, for no one may see me and live … Look, stand near me on this rock. As my glorious presence passes by, I will hide you in the crevice of the rock and cover you with my hand until I have passed by. Then I will remove my hand and let you see me from behind. But my face will not be seen” (Exodus 33:19-23, italics for emphasis). Moses wanted to look directly (face to face) upon the glory (the very essence) of the Lord. But under no circumstances would God permit this. Instead, the Lord God (Father) allowed Moses to gaze on the afterglow of God’s glory, but not directly facing God. Therefore, we need to again pose the question: Why would God make an exception and allow Moses and a group of more than seventy Israelites to stare directly at him and survive? When, in, fact, God would not even allow Moses to look privately at the uncovered “face of God,” and live. Or a better question: Was it an exception at all? Which is the same answer for all of the Old Testament appearances of God in human form: It is not God (Spirit) the Father, but rather God the Son who physically appeared to Abraham, to Jacob, to Moses and the elders. And later to Joshua, Gideon, Daniel, Zechariah, and others. Then to arrive for the final time in human form as Jesus of Nazareth. But this final appearance was different, as Christ lived among us for some thirty-three years. It was much more than just a brief (here now and then gone) but nevertheless significant epiphany for specific reasons as recorded in the Old Testament. With the providential purpose to demonstrate that God would appear in human flesh once and for all. This would be accomplished exclusively by David’s Lord, the Royal Son of God … the Messiah who is both David’s Lord and his corporal descendant through the tribe of Judah! The wonderful words of God’s angel have reverberated through the entire world for two millennia: “…I bring you good news that will bring great joy to all people. The Savior—yes, the Messiah, the Lord—has been born today in Bethlehem, the city of David!” (Luke 2:10-11). Said another angel to Joseph: “…do not be afraid to take Mary as your wife. For the child within her was conceived by the Holy Spirit. And she will have a son, and you are to name him Jesus (Yeshua), for he will save his people from their sins” (Matthew 1:20-21). “All of this occurred to fulfill the Lord’s message through his prophet: ‘Look! The virgin will conceive a child! She will give birth to a son, and they will call him Immanuel, which means God is with us’” (Matthew 1:22-23, quoting Isaiah 7:14). “…May you be filled with joy, always thanking the Father. He has enabled you to share in the inheritance that belongs to his people, who live in the light. For he has rescued us from the kingdom of darkness and transferred us into the Kingdom of his dear Son, who purchased our freedom and forgave our sins. Christ is the visible image of the invisible God…” (Colossians 1:11-15). Said Jesus to the people: “…Everyone who listens to the Father and learns from him comes to me. 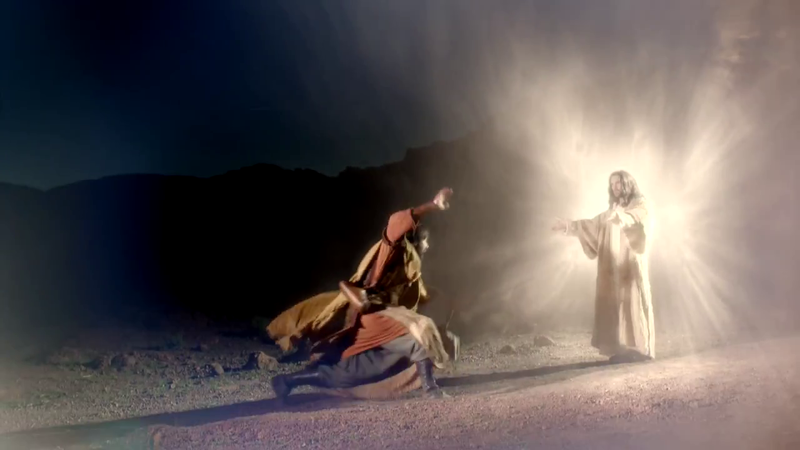 (Not that anyone has ever seen the Father; only I, who was sent from God, have seen him)” (John 6:45-46). One of Messiah’s disciples, Philip, said to him: “Lord, show us the Father, and we will be satisfied. Jesus replied, ‘Have I been with you all this time, Philip, and yet you still don’t know who I am? Anyone who has seen me has seen the Father!’” (John 14:8-9, italics for emphasis). “My Lord and my God!” (John 20:28).